First, the harbour, quay, most of the streets of Leith, its closes, bourses, etc., and also the King’s Wark were within the royalty of the City of Edinburgh. Second, North Leith was a portion of the Burgh of Regality of Canongate, the bailies of which were annually appointed by the magistrates of Edinburgh. The Canongate court-house was situated nearly two miles distant from the nearest point of North Leith, and for all practical purposes the inhabitants might have been said to be without a municipal government at all. Third, South Leith was a burgh of barony under the superiority of the Council of Edinburgh. Its boundaries were so uncertain that the magistrates could not tell their own territory. Fourth, with respect to the Citadel, its bailies were the same persons as those appointed by the city of Edinburgh to act as bailies of South Leith, but no court was ever held in the Citadel. Fifth, the bailie of St. Anthony was appointed by the minister, elders, and others of South Leith. Sixth, a great extent, probably much more than the half of the whole town, was totally unprovided with any municipal government whatever. The Leith people complained bitterly of a large portion of the town being unprovided with any local magistracy, and of the fact that, where there were bailies, the government of each was separate from and independent of the others. Owing to the uncertainty of the boundaries of the various divisions no one could tell before which bailie any particular cause or complaint should be brought. With respect to the town’s affairs, the cry of the citizens of the Port was equally loud. The streets were ill-paved and worse lighted. The people of the better class had oil lamps over their gates. The iron standards of some of these lamps yet remain as part of the railing enclosing the houses in Charlotte Street and James Place. In these iron standards may still be seen the link-horns for extinguishing the links or torches people carried with them to light their way through the streets when they went abroad after dark. Upwards of fifty lives were lost in four years for the want of a few chains and lamps around the docks. There were no police whatever in the docks and warehouses, and goods were stolen from the vessels and quays. The water supply was scanty in quantity and bad in quality, for it came from Lochend, as it does still to the docks, and was first brought in in 1754. The old waterhouse still stands by the lochside. In justice to the bailies it must be said that it was entirely beyond their means to provide adequate supplies of public water to take the place of private wells, broad and safe roadways, well-lit and well-paved streets, efficient police, and all the other benefits to which we are so accustomed to-day. They had very little power to raise money by the imposition of rates, their revenue being comparatively small, and coming from such indirect sources as feu-duties, customs on trade, harbour dues, and fines inflicted in court. They had no funds for the numerous services provided by the local government of our own day. Be that as it may, the people of Leith saw that they could not hope that their evils would be cured, or inestimable further advantages obtained, until they were governed by a body more or less representative of the people. There are three chief dates in this part of Leith’s struggle for a better system of government. In 1827 an Act was passed by Parliament providing for the municipal government of the town of Leith and for the due administration of justice. By this Act provision was made for the watching, paving, cleansing, and lighting of Leith, the boundaries of which were clearly defined. The magistrates of Leith, three in number, were to be annually chosen by the Town Council of Edinburgh from a leet or list of nine presented by the retiring bailies. By this means Leith could generally obtain the magistrates it wished, for the Edinburgh Council usually chose the persons most favoured by Leith. in 1833 the Burgh Reform Act was passed, under which Leith was made a Parliamentary Burgh, being associated with Portobello and Musselburgh in the return of one member to Parliament. In our own day Leith has its own member of Parliament, Portobello and Musselburgh being no longer joined with it for parliamentary purposes. In 1833 Leith was created a Municipal Burgh, with its own provost, magistrates, and council. On November 1, 1833, came the end of an "auld sang." The day of the bailies of Leith was over. Leith had come into its own. Looking back on these times almost a hundred years ago, we can see that the new order of things did not possibly cause much surprise either in Edinburgh or in Leith, so natural had been the stages towards it. When Leith at last obtained its own Town Council, the right of electing the councillors lay with such of the citizens of Leith as were qualified to vote for a member of Parliament, the town being divided into wards for the purposes of the election. The first Town Council, which consisted of sixteen members, met on the 12th of November 1833, and elected a provost, four bailies, and a treasurer. One of the first acts of the newly constituted council was to present an address to King William IV., rejoicing in the liberty which the Government had conferred upon the inhabitants of Leith, and assuring his Majesty that the provost, magistrates, and council of the town would use their most zealous endeavours to suppress crime, to reclaim the vicious, to instruct the ignorant, and to give encouragement to every measure tending to promote the interests of the people over whom they had been chosen to preside. The council unanimously elected Adam White to be the first provost of the town. Mr. White was one of Leith’s merchants, his firm, of which he was the founder, doing a large business in the importing of Baltic produce. Mr. White, who had carved out his own fortune in life, was much esteemed and respected in Leith, and had considerable influence in the council over which he presided. He was a lifelong friend of Sir John Gladstone, the father of the great premier, and a generous benefactor to the poor of North Leith. The history of the town in the new era of its local government has been one of rapid development and progress. Improvements in, and addition after addition to the docks, have kept pace with the demand for increased shipping facilities. Both town and docks are now efficiently policed, and the streets are well paved and kept in an admirable state of cleanliness. The electric lighting of the town and its electric car system are of the most up-to-date kind. A glance at the list of officials who were employed by the Town Council gives some idea of its varied activities. Here is the list: town clerk, chief constable, medical officer of health, burgh engineer, sanitary inspector, public analyst, electrical engineer, road surveyor, inspector of lighting and cleaning, tramways manager, superintendent of parks, firemaster, superintendent of slaughter-houses, and inspector of weights and measures. (1) The Dock Commission has charge of all matters relating to the management of the docks. (2) The Gas Commission looked after the gas supply of Edinburgh and Leith, as manufactured at the Commissioners’ works at Granton. (3) The Water Trust gave us the adequate supply of water, unsurpassed in purity, which we enjoy to-day. This water comes from reservoirs among the Pentlands and the Moorfoots. The Talla Reservoir, the latest and greatest of them all, is over two miles in length. Bailie Archibald, a Leith magistrate, is remembered in the Port as the man before all others to whom our splendid water supply is due. (4) The Water of Leith Commission carried out a drainage scheme on a very large scale. No sewage or refuse from paper mills or other works is now allowed to run into the Water of Leith, which, as a consequence, is once more a clear flowing stream. Leith has benefited enormously in health from the purification scheme. One of the largest schemes, and at the same time one of the most beneficial from a sanitary point of view, ever carried through by the Leith Town Council was the Improvement Scheme. Begun in 1881, the scheme swept away the greater part of the slums of Leith. Narrow, crowded, dark, fetid closes, with houses hopelessly insanitary, were demolished, and Henderson Street formed with its open spaces. The result has been a great advance in public health. At this point in our Story of Leith we take leave of Leith Town Council, which has now passed out of existence after a lifetime of eighty-seven years. In 1920 an Act was passed by Parliament providing for the amalgamation of Edinburgh, Leith, and other districts, so that Leith to-day forms a part of what has been called Greater Edinburgh, to the Town Council of which she returns twelve representatives. It is to be noted that among other stipulations the Act provides for our town retaining the name with which so much history and so many traditions are connected—the name of the Port of Leith. "22 Jany. 1685.—The Session ordained a groat per week to be given to a poor child in Caidtoun (that is, the Calton, which then as now formed part of South Leith parish) who is fatherless and motherless and hath nothing qrby to be sustained or keeped from starvation. "15 Mch. 1691.—To Marjory Cruden who fell over the Shore among the ships anchors and was sore hurt, 14s." As the money mentioned is Scots money, and as 14s. in 1691 would represent is. 2d. nowadays, it cannot be said that the treatment of the poor in those times was of too extravagant a nature. As a matter of fact, kirk sessions had sometimes very little in hand to disburse in the form of charity. In 1845 the Poor Law Act was passed under which two Parochial Boards—one for South Leith and the other for North Leith—were set up, each consisting of so many members nominated by the kirk session and so many elected by the ratepayers, and to these bodies the kirk sessions handed over the care of the poor. These Parochial Boards each built its own poorhouse, that of South Leith being erected in 1850, and that of North Leith in 1863. These two institutions have now been superseded by the large and modem poorhouse at Seafield. In 1895 one Parish Council for the whole of Leith took the place of the two Parochial Boards, the members of the council being elected entirely by the ratepayers. The Parish Council not only looked after the poor, but performed several other duties as well. It levied the poor and education rates, attended to the registration of births, marriages, and deaths, and so on. When the corporations of Edinburgh and Leith were amalgamated in 1920 the Parish Councils were also united, Leith returning eight of the forty-six councillors who comprise the Edinburgh Parish Council. From the Reformation down to the beginning of the nineteenth century the kirk session of South Leith was the education authority of the town, maintaining two schools—a grammar school for higher education and a school for the poor where the children were taught to read the Scriptures. In 1806 the grammar school was transferred from the Kirkgate (where the accommodation had left a great deal to be desired) to the Links, where a new school, the High School, had been erected, the necessary money having been raised by subscription among the citizens of the town. In 1848 the "High School Trust" was vested in the magistrates and council of Leith, along with the two ministers of South Leith. This Trust managed the school until 1872. In that year the Scottish Education Act was passed, setting up in each burgh or parish a School Board, with power to impose rates for the upkeep of the schools. The first meeting of the Leith School Board was held on April 22, 1873, its chairman being James Watt, provost of Leith. Mr. Watt held the position of chairman until his death in 1881. It was to this body that the High School was handed over. The School Board continued to control education in Leith until 1919, when their powers passed to a new body, set up by the new Education Act of 1918, and called the Education Authority. 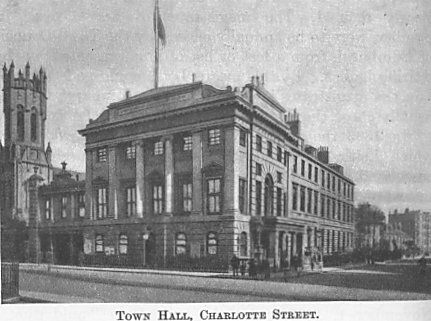 Here it may be said that while the Act of 1918 set up county authorities to take the place of parish authorities, and thus made great changes in educational affairs in Scotland, the passing of the Act made very little change in Leith, which was one of five burghs that did not come under the county authority, but were allowed to form separate education areas. The number of schools continued to increase in Leith from 1872 onwards, and so we find that in 1919, when the Leith School Board handed over its schools to the newly constituted Education Authority, these schools numbered no fewer than eighteen, exclusive of three special schools—one in North Junction Street, for mentally defective scholars; one at Clarebank, for pupils whose health required special attention; and the third at Ceres, Cupar Fife, for Leith children likely to be benefited in health by a stay in the country. Of the eighteen schools, one—Holy Cross Academy—is an Intermediate School providing a three years’ curriculum in languages. mathematics, science, art, and other subjects; while two—Leith Academy and Trinity Academy—are Secondary Schools, providing a six years’ course for the Leaving Certificate, the passport to the University. Leith Academy, under a changed name, is that High School whose fortunes until 1872 have already been sketched, the School Board making the change of name in 1888. 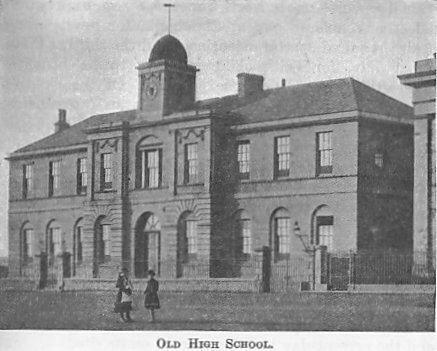 The old building continued to exist under its new name until 1896, when it was demolished, having become altogether inadequate to meet modern requirements, and the present-day building erected on its site. The Leith Education Authority had a short-lived existence. Just as the Amalgamation Act had combined the Town Councils of Edinburgh and Leith, and also their Parish Councils, so also it combined their Education Authorities. The Education Authority of Greater Edinburgh consists of thirty-four members, seven of whom are Leith representatives. And now with the amalgamation of the two communities the story of Leith as a separate municipality comes to an end. The people of Leith had no wish to see their town lose its identity as a separate burgh, and on a plebiscite being taken showed by a vote of 26,810 to 4,340 that they did not wish amalgamation. But the union of 1920 is very different from that of the old unhappy days before 1833. The relation of Leith to Edinburgh then was one of serf to overlord. In this later union of 1920 Leith joins Edinburgh on equal terms, and will co-operate with her for the good of the joint community with no less zeal than she worked for her own welfare when a separate burgh.